Although she modestly claims her strategy isn’t much, Christine’s simple plan to increase her exposure is extremely successful. Christine engages readers and visitors alike using the combination of quality, original content, and cross-traffic from her website, blog, Squidoo lens, and articles on EzineArticles.com. Never stop trying to be heard/read. Be open to take advice/learn/improve – never ever give up or stop believing in yourself. Analyse … over and over; edit … again and again. Read your work out loud – preferably to someone else – but at least to yourself, no matter how foolish it seems. It’s the best way to detect inconsistencies and omissions in rhythm, grammar, punctuation, and ‘see’ spelling errors and ‘typos’ … The best of writers get carried away at times with the thoughts tumbling out of the brain faster than a champion typist could cope with. Don’t accept the auto-corrections or suggestions of Spell check. It has no imagination. [It] accepts words like ‘hear’ and ‘here’ (even in the most ridiculous context), [it] rejects truly great words you have maybe invented or embroidered – and [it] also rejects out-of-hand universally accepted slang words or proper names. Heed Christine’s advice to persevere with your own article writing efforts. And remember: “All good things come to those who wait.” Be patient with your writing efforts – success is just around the corner. Do you have a question or comment for Christine? Feel free to leave it in the comments section below. Such article are quite inspirational. I have had a very old desire to write all that I know if it helps others and helps me too. I have just started writing and was getting bit upset as to why people are not viewing my article. Your inspirational note has again aroused in me the desire to write once again. Nice to know about Christine Larsen. Examples like this motivates us to create new innovative article. A very warming article Cristine. My husband and I are just beginning to get some real effects from writing articles on EzineArticles. We have other places we have sent articles but we seem to always head back to EzineArticles as they do answer within reasonable time and they have a great web page that guides us. Good luck in your endeavors and don’t give up. That is a nice one Christine. As for me I have a burning desire to continue writing articles. However, as a new beginner, I faced a lot of challenges in the articles I submitted to EzineArticles, base on either URL, spelling or grammatical error. As a result of that, my account was suspended. This has shut me out from making any move to write article, I expected some patient from the EzineArticles Editors as well. Christine, Your article is inspirational to me,but do you have further advice to give me on how to overcome this situation? I’m sorry to hear that you had a bad experience with your article writing efforts. Please understand that our Editorial Guidelines exist to improve the overall quality of your articles, but the learning process can be a little challenging. The best way to overcome a situation like this is to simply talk to us. In most cases we can resolve the issue and assist you back into the writing saddle. With that thought in mind, I have passed your comment on to our Member Support Team and will have them contact you ASAP via email. In the future, feel free to contact us by clicking on the “Contact Us!” link in the upper-left corner of the member interface. Samuel, After all was said and done I couldn’t help myself when reading your blog. There were three words that were not correct. One of the was patient, it should have been patience. I am not saying this to knock you down but EzineArticles does have high standards for your sake and that of your readers. You really need to use spell check and it will help you get those articles accepted. Good luck. This spell check is there to help in this matter. 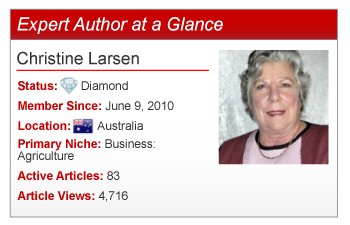 Congratulations to a lovely lady and a talented writer on being awarded ‘Diamond’ Status on EzineArticles. I’ve followed Christine’s writings for quite a while and am enchanted with her writing style. She has a special way with words and her unique brand of humor brightens up the darkest day. Congratulations, Christine, and I look forward to many more articles by you. Well done Christine you have worked hard and deserve to be recognized for all your effort and clever writing. I know you will keep on being more and more successful. I love Christine’s articles and am subscribed to her feed so that I get the latest articles she posts. This was a very thoughtful and useful posting about Christine and her work, thanks! Thank you for your swift respond. I do hope that they will give me another chance. Thank you very much for your observation, but you did not help me good enough, I expected you to point out the remaining two errors so that I will take correction next time I am ready to learn and take correction always. And I want to say that you did not proof read you blog before transmitting. As my Mum always said to me, “Keep your chins up, dear”. I am attempting to have an article published to answer one part of the problems you expressed – to show you some of the angst all of us experience with Spell Check that should solve all problems, but sometimes just creates more. You see, sometimes we still have writing difficulties, even at the level I have achieved. Take heart Samuel, and just keep on, keeping on. And please don’t worry about anything but keeping up your own self-belief. I am living proof that it works – eventually. Be patient, keep practicing, and believe. It WILL happen, one day soon. Samuel, The other two words were base on URL should be based. And the third you needed an s where you stated that you would like to write more articles. You were also correct in my spell check as I should have said one of THEM. So thanks for your input. Christine, Thank you for the advice. Kay, I appreciate that, thank you very much. Wish my way could go like Christine. Christine – That was lovely. People like you and the EzineArticles platform provide me with just the right amount of incentive to go ahead each day. Thank you very much. I would love to get your feed back on my articles – may serve as an eye opener. I am about to read your articles and absorb as much as I can to enhance my work. She has written excellent articles. Hello, Christine, what an inspiration you are. I am a grandmother too and have been trying to get my website off the ground since last December. I have a blog as well and after every article I keep wondering why so few people read it, based on the number of comments. I have just been learning to cross link those two sites and inside pages as well. Now with EzineArticles I have more ammunition if only I would get my first article IN! I think I will do that soon, and I am going to look for your articles too. Sounds like they will be right up my alley. Hello, Christine, what an inspiration you are, the living example of ‘try, try again’. That’s what I’m going to do. I’ve just learned to crosslink my website with my blogsite to rev up the readership. If I get going on EzineArticles that would be a great boost. The thing is to start! I am so tardy. After reading your blog here I’ve gotten some kickapoo juice. What a nice lady you are. I’m going to look for your articles. Christine, thank you so much for your encouragement. I needed that! You have offered some really helpful advice. I wanted to add that for some new authors, reading it out loud may not help them to locate the errors because we may speak in ways that are not grammatically correct. It may be important, at first, for a new author to ask someone else to review their articles until they get more used to making their own corrections. I agree with what Dr Erica said. I always proof read what my husband writes and he proof reads my articles. It saves a lot of frustration and the saying two heads are better than one holds true. We are both retirees also and every bit of constructive criticism helps before hitting the submit article button. Have a great day. Christine, at the risk of sounding pedantic, there are 2 spellings of the word: PRACTIS/CE. The “s” is used when it is a verb, as in “I practise piano as little as possible.” Then there is the other spelling, when the word is used as a noun: “She started her doctor’s practice straight after her graduation.” So, in your last post to Samuel:”Be patient, keep practicing, and believe. (sic)” The word should’ve been PRACTISING! I seriously don’t mind if anyone would like to correct my work, as I haven’t studied English since Year 10, but have studied other languages. This is often the only way to learn about our own language and its various intricacies. It’s one of those pesky words that always stump people! Cheers and keep up the great work! That’s a curious one, Katharine – obviously various dictionaries differ – I use the online Dictionary.com, and find no conflict with the meaning or its use as a verb – however, I do usually choose British spelling and that would have been ‘practise’ – so you’re right, I was wrong. Sincerest thanks to everyone who took the time to comment on my Showcase. help others to believe in themselves – again, or maybe for the first time. Others were kind words from good friends I have made along my writing path. Thanks also to the additional thoughts suggested – there’s always room for learning and ‘rethinking’. Thanks to Christine Larsen. Her writing so excellent. Christine – Thank you for sharing your strategies. They are the most simple and practical tips which we often tend to ignore. Thanks again and all the best. I like keeping up with your articles. It honestly makes the day. nice to meet Christine here. she is a excellent writer.